New York (AFP) - Celebrities, political leaders and the masses rallied in New York and across the globe Sunday demanding urgent action on climate change, with organizers saying 600,000 people hit the streets. Hollywood actor Leonardo DiCaprio, UN chief Ban Ki-moon and Mayor Bill de Blasio all marched down New York's Sixth Avenue, as part of what was proclaimed the largest climate protest worldwide in history. 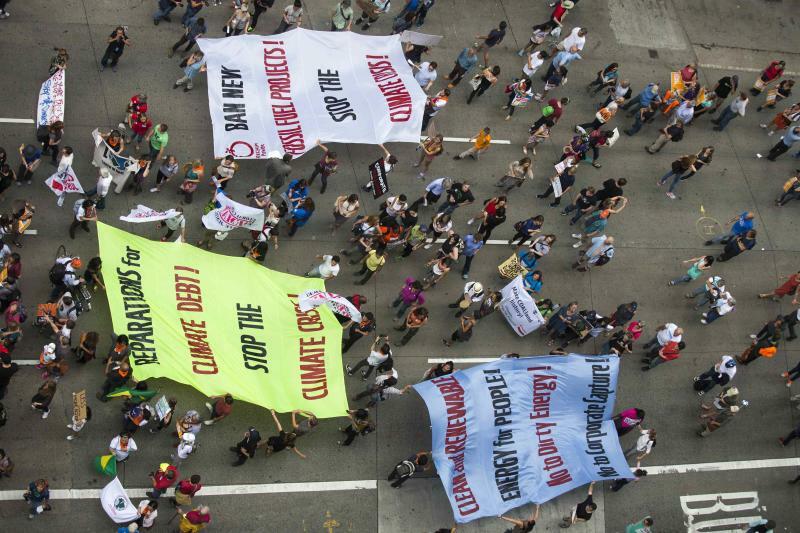 There were colorful and boisterous rallies in other major cities in Latin America, Europe, India and Australia, designed to build pressure ahead of a climate-change summit hosted by Ban in New York on Tuesday. In New York, where organizers said 310,000 people took part, elderly protesters -- leaning on walking sticks and sitting in wheelchairs -- joined young parents with children in strollers, adults in fancy dress and community groups. There were chants of "hey, hey, ho, ho, fossil fuels have got to go," as the good-natured march snaked down Sixth Avenue with giant floats, balloons and banners with slogans such as "Urgent, Save our Planet." Ban, wearing a baseball cap and T-shirt with the words, "I'm for Climate Action," praised de Blasio for announcing Sunday that New York would reduce its greenhouse gas emissions by 80 percent from 2005 levels by 2050. "I am overwhelmed by such a strong power, energy and voice of the people, I hope this voice will be truly reflected to the leaders when they meet on September 23rd," Ban told reporters. "There is no plan B because we do not have planet B. We have to work and galvanize our action." The UN secretary general walked nine blocks in the parade with US former vice president Al Gore, who is now a climate advocate, de Blasio, French Foreign Minister Laurent Fabius and French Ecology Minister Segolene Royal. "Our mission is to make this a decisive moment, a turning-point moment and I felt today that I was seeing history starting to be made," de Blasio said. In addition to New York, another 270,000 people turned out at about 2,500 events around the world, organizers said. 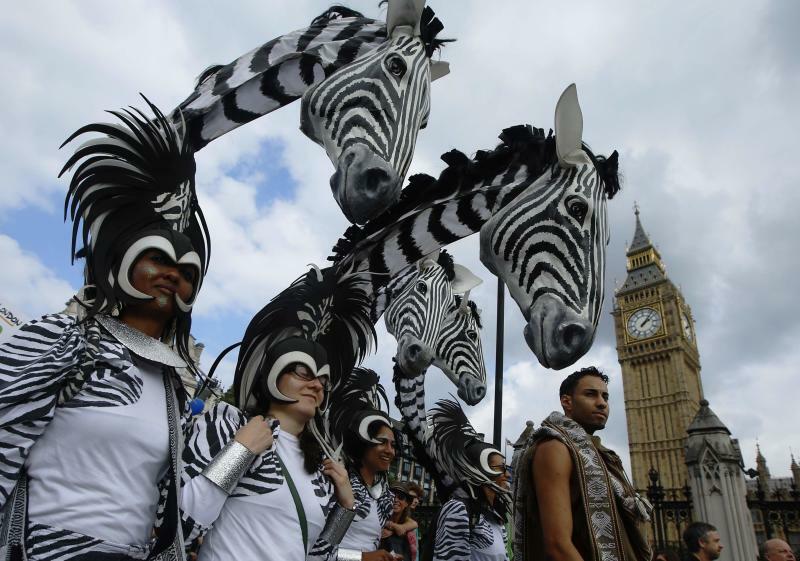 In London, an estimated 40,000 people paraded past Trafalgar Square and the Houses of Parliament, including actress Emma Thompson, who likened the threat posed by climate change to a Martian invasion. The pressure group Avaaz, which helped organize the rallies, said 30,000 people turned up in Melbourne and at least 15,000 in Berlin, where the crowd braved pouring rain, and another 5,000 in Rio de Janeiro. In Paris, where police estimated that 4,800 people protested, many came on bikes with banners that read, "Climate in danger" or "World leaders, act!" "Before we could say we didn't know. Now we know. Climate change is already under way," Nicolas Hulot, the French president's special envoy for the protection of the planet, told the crowd. In Madrid, hundreds gathered in front of the environment ministry, brandishing signs with slogans including "There's no Planet B," "Change your life, not your climate," and "Our climate, your decision." In Cairns, Australia, where finance ministers from G20 nations were meeting, more than 100 people wearing green paper hearts around their necks gathered outside the venue. Hundreds also massed in Sydney and in New Delhi, where around 300 protesters carried placards that read "I want to save forests" and "Coal kills", as they shouted slogans and danced to pounding drum beats. An estimated 5,000 people, some on bicycles, rallied in the Colombian capital Bogota, where some played instruments made out of recycled materials to form a noisy backdrop. Ricken Patel, executive director of Avaaz, presented a petition signed by two million people to Ban in New York. "Climate change is not a green issue anymore, it's an everybody issue," he said. The "People's Climate March" in New York was endorsed by more than 1,400 organizations, including environment, faith and justice groups, as well as labor unions. Students mobilized marchers from more than 300 college campuses. The protest wound its way from Central Park through midtown on a two-mile (3.2-kilometer) route ending at 11th Avenue between 34th and 38th Streets. After a moment of silence, slightly obscured in the chaos, participants used instruments, alarms and whistles to make as much noise as possible at 1:00 pm. The UN meeting Tuesday sets the stage for a crucial conference in Paris in December 2015 aimed at finalizing a new global climate change pact.